WHAT IS A ‘SEAL OF APPROVAL’? The Seal of Approval is awarded to casinos that comply with our standards for excellence and fairness and that have successfully applied. In displaying the Seal of Approval the website carrying the seal has agreed to honor and abide by pre-determined criteria for integrity and business ethics whatever the circumstances may be. We are proponents of fair gaming practices. Owning a Seal of Approval is no longer a matter of choice. It’s the single-most efficient way to let your customers and business partners know that your website has undergone rigorous and thorough reviewing process that has established your credentials as a genuine portal and operator. By obtaining B.O.C.S’s Seal of Approval, you will increase your user base, improve upon your short and long-term prospects, and know that you have been vetted and backed by a dedicated service of experts with years of experience in data research and risk & compliance. Our award-winning team of casino-reviewing experts are perfectionists and so only the best online casino sites receive our seal of approval which signifies maximum criteria marks across the board. All operators are periodically re-tested with their certificate updated and re-issued or revoked. Customers need to know they are safe simply by association with the displayed Seal but there are falsely generated seals and certificates out there. 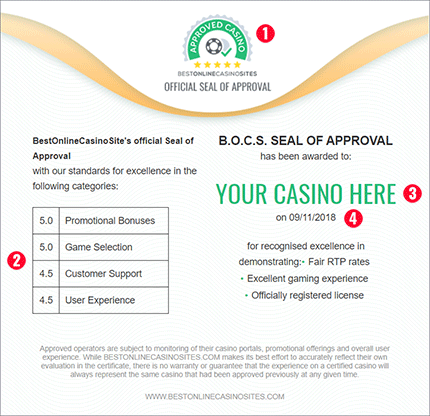 This is why any casinos that have received our Seal of Approval will have their certificate displayed on the original, SSL-encrypted www.bestonlinecasinosites.com domain, so players will know it is secure and genuine. The reviewing process of a casino is an inherent process to awarding the Seal. This entails scrupulous examination of the operator’s gaming history, banking facilities, and transparency policies. Assuming and delivering on social responsibility checks should also be part of what a Seal of Approval stands for. Fairness of gameplay along with security are of utmost importance and they go hand-in-hand with proper licensing issued by an authorized body. Playing in a secure, safe and fair environment is a must. The first step to earning our seal is making sure that a casino is fully licensed. This means that it must contain a valid casino license from one of the top casino licensing jurisdictions. In addition, the casino must be independently audited and tested for Fair Play. If it has an eCOGRA certification or similar, we inform you accordingly. We also take a meticulous look through the history of a particular operator and investigate potential past issues. Part of our process requires that we check that casinos applying for our seal come with a number of reliable banking options. We examine their payment solutions and make sure that casinos try to mitigate costs for their customers while ensuring expediency. If a casino fails to meet our pre-determined standards, it may not receive accreditation from our service. Furthermore, we deposit and withdraw our own money, reporting the results objectively. Customer support is essential to the smooth communication between you and the portal. We reach out to support, gauging responsiveness, efficiency, friendliness and readiness to solve your issue. Suffice to say, the better a casino performs based on this criterion, the higher the rating we’ll give it. Players enjoy variance of the gaming products offered. Players would look for a rich portfolio and a decent selection of software providers. As a result, our service focuses looking into the available titles and developing studios, issuing recommendations if certain areas should be improved upon. A rich selection of games is not crucial, but it’s important and we take our time with it. Our team really puts the pressure on casinos when it comes to compatibility and customizability. We expect all casino’s offers to be mobile-friendly. It helps to have a multi-lingual interface and list of currency options, making the casino agreeable to all players no matter where they reside. Multiple platform gaming is a must, and we are looking for user-friendly interfaces here. This is the section where casinos tend to slack, and if they do, we’re on top of it in a flash. We carefully examine a bonus’ wagering conditions for you. Most players just accept these provisos without giving them a proper read through. Our team members break down the T’s and C’s. After our research is completed, a promotion that hasn’t met our standards or that offers misleading T&C is disqualified. Once we have fully tested a casino and accumulated all the information we are looking for, we offer the findings in detailed form. Our findings allow us to issue a proper ranking based on the described process. The higher the rating, the better a site is. We stand by our decisions and a seal by our service is a hallmark of success and integrity in business. Trust BOCS and trust your operator.